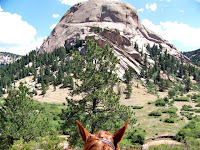 DOME ROCK~ Yet another of my favorite rides. Takes me about 2.5-3 hours to ride this loop of about 10 miles. 2.5 if Luke is in any kind of shape, 3 hrs to take it easy-ish and take lots of photos, which I did yesterday. It was gorgeous out, hot, clear, sunny. A perfect day for this ride. Most folks are sitting in their air-conditioning, I take off and go find a cool spot to ride. 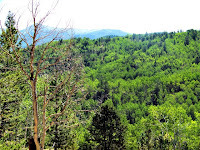 This one offers a nice long climb to the top of the world where you can see 360degree peaks surrounding meadow covered hillsides and pine and aspen covered mountains. 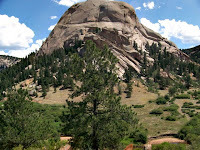 DOME ROCK! There it is, stately and proud against the blue Colorado sky. The ride to this spot is great! 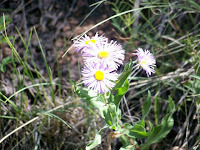 Heres a shot of some purple asters clustered against the hillside. I took this from the saddle on Luke. This is a really fun trail for some minor technical spots, rock hopping, knee banging even some toe twisting. I ride it backwards and forwards quite a bit so can cruise along in high gear once Luke gets rid of his hay belly. Its probably not going to happen this year! ha ha ha! I warn ya now that you might only see horse ears. I take a lot of shots of Lukes ears! 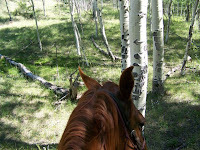 Look closely in the shot below; the aspen tree has an Arrow that SOMEBODY carved into it many moons ago, perhaps as a trail marker cause this used ta be a mountain goat path back in the day.....leads to some beautiful single track, aspen groves, springs, cool grassy meadows. Used to be an old line or miners cabin along this route, but that has since fallen and been taken by Ma Nature. I sell Real Estate and am always happy to help someone out. Saturday morning broke clean and clear, as I watched the sun rise over Pikes Peak I'm thinking to myself "Good day for a ride". Heres a shot of the poor victim awaiting his fate, the little red one on the right. His name is Luke. His pasture partner/boss is Major, who is the boss of all he surveys and lets everyone know it. Big bossy boy. 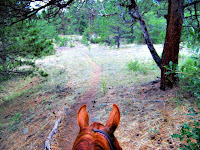 So I loaded ol' Luke up and headed out to one of my closest and most favorite places to ride, Deer Haven. 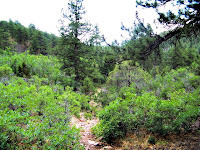 Its a little chunk of BLM just off the High Park Road which is also County Road 11 in Fremont County, Colorado. 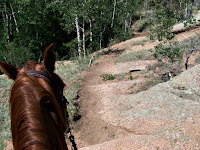 From here I can ride to some really high overlooks, through varied and spectacular terrain, oak bush, Ponderosa Pines, Aspens, grassy meadows, granite and quartz outcroppings. I always manage to see something really cool here. Last time I flushed a black bear. We were both surprised! Ol'Luke, boy he sure scooted along the trail after seeing that little blacky. I also caught a coyote marking territory before he scented me. 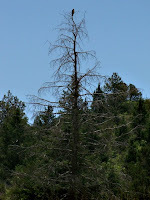 Today I got a shot of this hawk hanging in this tall dead tree overlooking his world. This was in a meadow full of oak brush and lots of rabbits and little birds. This ride took 3 hours on Saturday. I also ran into some old friends who came up from Canon City. 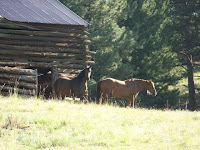 They were poking along on some Quarter Horses. I hadn't seen this gal for 2 years and here she was riding along on a nice bay horse with a group of friends. So I should warn you that there is hardly any photos of me cuz I am always taking the pics and besides, am pretty hard on a camera. 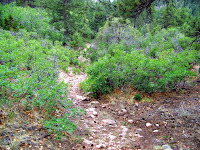 But I like to take good pics of the trail, its always nice to see what the trails look like if you are a rider. Anyway, thats what I did on Saturday. 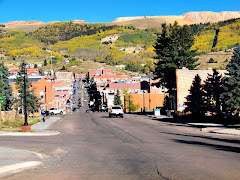 carrie@goldcountryco.com or through my office in Cripple Creek. All the numbers are on my website. Thanks for reading! I would love to hear comments!